MSR-Electronic: Coal based power stations are facing increased expenditure for the green house gas saving programmes and increased liability insurance premiums for fires/explosions. Each year millions of Dollars are wasted in coal handling plant fires / explosions in coal stock piles, coal conveyor belts. Further coal based power plants are facing growing need to increase productivity. While power stations do install outdated devices like temperature or smoke sensors for fire detection, but by the time smoke is generated and detected – it is already too late. It is now time for the power plant engineers to address the early fire detection issues by employing latest technologies in CO and CH4 monitoring for very early fire detection and explosion prevention. More and more power plants, coal handling plants and coal preparation plants today are using carbon monoxide products of combustion / spontaneous combustion of coal sensors to detect very early smouldering fires or hot spots and methane detection to prevent explosions. Coal contains moisture which when liberated, coal gets oxidised, generating both heat and carbon monoxide. This heat when builds-up has the potential of creating spontaneous combustion of coal fires. Coal is extremely friable and can be easily crumbled or pulverised. Further coal also generates coal dust needing extra preventive measures like proper maintenance of stockpiles, guarding against accumulations of coal in the fuel-handling system, compaction of stockpiles, cleaning spills and washing float dust. The most effective programme for fire-prevention would be to have Carbon Monoxide Monitoring and Control System. There will always be some safe background CO levels in coal handling or processing plants under normal operating conditions. These CO levels will rise during coal loading, handling and will again settle to normal levels once loading is finished and ventilation fans are running. It is important to find out the normal background CO levels by installing CO data-loggers and observing the CO generation trends under normal operating conditions of the plant. A typical CO level of 50 ppm of CO is normally present in background levels when coal is being handled, moved or transported. Based on these normal background CO levels the sizing/selection of the CO system (range etc) and alarm set points need to be undertaken. In general, it is wise practice to locate an adequate number of sensors at strategic locations based on knowledge of the potentials for ignition. When considering belt fires, sensors should be located in close proximity to drives, tail pieces, and main rollers. When coal is the issue, any location where accumulation of coal dust or bulk quantities is likely or expected should be considered. These include belt transfers, crushers, dust collection systems, and storage bins (silos, bunkers, etc.). A typical system may consist of number of CO (range: 0-300, 500 or up to 1000 ppm) and or CH4 (range: 0-100% LEL) gas sensor/transmitters installed remotely at strategic potentially risky areas. 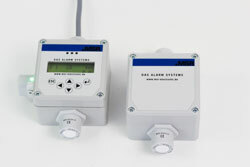 The 4-20 mA output coming from these sensor/transmitters can be connected to a multi-channel gas controller which can handle from 2 to up to 96 remote sensor/transmitters. When CO concentration levels rise beyond the set limit (say above 100 ppm, depending on safe background levels), the built in relay contacts will automatically generate audio-visual alarm for plant supervisor to take corrective measure (ventilation fans, mains shut-off etc).